Meet our Aussies - Welcome! 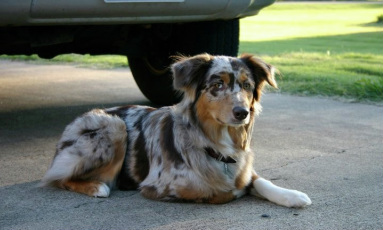 Maya is a red merle Australian Shepherd, AKA aussie that every cowboy and cowgirl wishes in a dog! She is an amazing Family dog and she herds great! Maya instictively showed us what she was bred to do once we got her out into the cow pasture. When the cows and chickens see her coming you can almost hear them say "we are in trouble now fellas". Maya is a quick and agile dog while on an agility course, she is bidable and has an extremely high prey drive; herding cattle or just fetching her favorite toys. she will give beautiful coated and well driven puppies. Maya will pass her STRONG herding insticts and prey drive to her litter and show them the ropes of being the best dogs for you!. 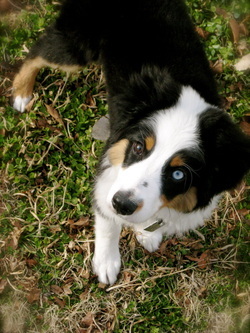 Bentley is a Tri colored Miniature Australian Shepherd, AKA mini aussie. At only 4 months old he shows amazing conformation. He possess all the ideal breed standards. He is currently being trained in being a service dog. He has a great prey drive for a puppy, though he knows when to relax and enjoy the moment. Bentley will throw gorgeous puppies.